The Young Farmers’ Clubs of Ulster were present at this year’s National Ploughing Championships at Screggan, Co Offaly. Now in its 87th year, this event is one of Europe’s largest agricultural trade shows. Despite Storm Ali forcing closure upon day two of the event, overall attendance totalled 240,700. The Harry Ferguson Safe Tractor Driving Competition was a big hit on the last day. Young farmers displayed their safety skills while driving around a specially designed tractor course. 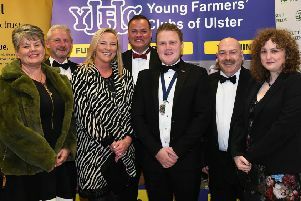 Northern Ireland was represented by James Purcell from Dungiven YFC and Geoff McNeill from Garvagh YFC, with Geoff gaining a remarkable second place overall, and winning a trip to France. He commented: “I was delighted with the opportunity to represent Northern Ireland and my club, and coming second was superb, taking into consideration the skill and effort everyone put in.